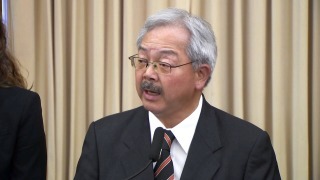 San Francisco Mayor Ed Lee. San Francisco Mayor Ed Lee on Tuesday announced a $9.6 billion budget proposal for the next fiscal year that emphasized funding for homelessness services, police reform efforts and neighborhood services. The two-year "no cuts" budget proposal, a sharp increase from last year's $8.9 billion budget, reflects good economic times and includes a 4.1 percent increase in the number of city employees to 30,800. The increase is largely due to hiring in the police and fire departments, the opening of the new Zuckerberg San Francisco General Hospital and service increases in the San Francisco Municipal Transportation Agency, according to the mayor's office. Speaking before some members of the Board of Supervisors, Lee said the budget was intended to meet public demand for "safe and clean neighborhoods" and solutions to homelessness that "reflect San Francisco values." Describing homelessness as a "top priority," Lee said the budget included funding for a third Navigation Center shelter, increased services and hours in existing shelters, expanded medical and mental health services and increased staffing for Homeless Outreach Teams. It also includes more than 300 permanent supportive housing units and housing subsidies for seniors and the disabled. Starting July 1, the city's homeless services will be consolidated under the newly created Department of Homelessness and Supportive Housing, led by Jeff Kositsky. With a $221 million budget and 107 positions, the department is intended to help reach a goal of getting 8,000 homeless people into permanent housing by 2020, Lee said. "I'm confident that under his leadership we will make homelessness rare, brief and a one-time occurrence," Lee said. The funding proposal drew the enthusiastic approval of Jennnifer Friedenbach, director of the Coalition on Homelessness, who said the investment in supportive housing and housing subsidies was especially critical. However, she noted that much of the mayor's plans depend on the passage in November of a sales tax increase to support homelessness programs and transit. "We need more revenue and a sustained revenue source so we can do even more," Friedenbach said. "If voters support this sustained revenue for homelessness, combined with a new department head who understands this issue, who comes from the community, we have the potential to really do a lot." Responding to a community outcry over police shootings and other recent department scandals, Lee's budget also includes more than $17 million in previously announced funding for violence prevention programs, police reform efforts and increased training in areas such as implicit racial bias and crisis interventions. That figure also includes $1.8 million for additional investigators in the Office of Citizen Complaints, which investigates allegations of officer misconduct. The two-year budget also includes funding for seven police academy classes, an increase from the current five. Lee said the classes would help the department reach a goal of 1,971 officers by the end of 2017. Supervisor John Avalos said he questioned the need for that many more police academy classes given concerns over reports of resistance to police reform measures in the rank and file of the department. "There hasn't been enough effort to make sure that the reforms that we're seeking are absorbed and carried out by the rank and file officers," he said. "Committing to more academy classes when we haven't figured out how to do that doesn't make good sense. Avalos suggested that the board might consider using its budget authority to hold a portion of the department's budget in reserve, to give the department a chance to demonstrate progress on reform measures. Avalos' proposal drew an immediate rejoinder from Supervisor Scott Wiener on Twitter, who said "we need more beat cops to deal with SF's crime wave." "I'll fight for this," Wiener said. The budget also includes $6.1 million in funding for increased street cleaning and two new Pit Stops to increase the availability of portable restrooms. In addition, it includes $29 million in capital investments in city parks and expanded hours at 14 library branches. The budget also proposes placing $380 million, 8 percent of general fund revenues, into reserve funds.